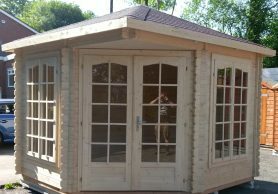 We now stock the best quality Log Cabins and Garden Buildings available on the market produced by Palmako. These buildings are manufactured to the highest possible standards in a computer controlled state of the art facility. Made exclusively from responsibly sourced European timber, these buildings would be a feature in any garden. We at Conquest Joinery are their local stockist and would be happy to discuss any requirements you might have for that big garden project. The range on offer is extensive to say the least, so please Contact Us for a brochure. From sheds and garages to complete houses, there really is something to suit every taste and budget. The Palmako Melanie 6.8m2 you see pictured on the left, is now available for home delivery straight from the factory for the incredible price of £2035.